So how do you start? First, you need to be in the right mind frame. Then you need to recognize the energetic impact that your thoughts and emotions can have on your living space. How do you feel when you walk through your door? How do you want to feel? Clearing old habits and resisting behaviors takes time. In our Western culture, we’re taught to be productive, always doing, going, staying busy but sometimes you need to slow down and just be. Sometimes you need to let go of things and thoughts that are no longer serving you. It’s about letting go to allow yourself to live in a peaceful place that creates a feeling of calm & order. So how are you going to create a system or a process that works for you? Clearing is an inside job that begins and ends with you. Secondly visualize how you want the space to look? The best way to start decluttering is to schedule it on your calendar. Pick a time frame that works best for you don’t worry about blocking off a full day for the job. Choose a small chunk of time, whether it’s 15 minutes or three hours, and really go for it. Set a timer if you need to. Listen to your favorite music. Start with the area that will impact your daily life the most! Visualize how the room will look uncluttered. Then figure out what is essential and get rid of the rest. Notice the big items creating chaos in your space. What are the most essential pieces of furniture? The placement of furniture in a space like your coffee table, sofa, bed etc. can often contribute to visual clutter and make it more difficult to stay organized in the long term. If you have too much furniture in a room or there are large toys that haven’t been used in a long time (over a year) then move those items out first. What doesn’t belong in the room but has just gravitated there? What is on the floor (hint: only furniture and rugs belong there) and what is on other flat surfaces? Reorganize the space and this will invariably motivate you to keep going. Next, get your house so that all flat spaces are clear of clutter. Start with visible surfaces like tops of counters, tables, desks and dressers Wherever you start, make a rule: nothing can be placed there that’s not actually in use. Clear off everything possible, except maybe one or two essential things. Everything else must be put away! Papers often account for a lot of our clutter. Designate one spot for incoming papers. Create an inbox tray or spot, this little change will transform your paperwork. Then set up some simple folders with labels & categorize your papers. Once you’ve created your system, learn to file them quickly. Go through your pile of papers one at a time starting from the top working down. Make quick decisions: trash them, file them immediately, or make a note of action required then file that in the “action” file. Don’t put anything back on the pile or put them anywhere but a folder or in the shredder or recycling bin. Once you’ve cleared the clutter from those areas, you can dive into your drawers and cabinets and closets. Ask yourself do you use it regularly, love it or if not then lose it? Use the four box method: trash, donate, keep or relocate. Take baby steps – one drawer or cabinet at a time using the same technique. Categorizing things as you go through them and keeping like things together forces you to organize your home. It’s crucial to find a designated space for every item you own. If you don’t know exactly where things belong, you must designate a good spot. Store like items close to where you use them. When placing items back into the drawers try adding dividers or small containers so you can store like things together. Once you’ve created order, always put those things back where they belong. This will save you time by reducing frustration in your daily life. Decluttering closets is therapeutic but it’s no surprise that we are prone to stuffing or leaving things we don’t want to deal with in closets. Out of sight out of mind! The process of going through clothes, shoes and other long-forgotten belongings will help you cleanse your house and your mind of any emotional baggage that may be connected to these items. Start from the Bottom of the Closet and Work Your Way Up. Cleaning up and clearing out the mess at the bottom of the closet will free up space in which to work. When sorting clothes and shoes, ask yourself: does it fit, is it damaged (stained, torn, faded) and has it been worn in the past year. If your answer is “No” then put it in the box to either donate or trash. If you have something that is sentimental or only wear it on special occasions, put these items in a storage bin to free up closet space. The same goes with shoes. Install another shelf at the top of your closet for storing mementoes and out of season clothing. To weed out the rest, try the “backwards hanger” trick over the course of the next year. Start the year with the hanger tips all facing the front of the closet (backwards). After you wear something, put it back in the closet with the hanger facing the back. At the end of the year, you’ll be able to easily identify the clothes that just aren’t worth keeping anymore. Remove everything from your closet shelves, wipe down the shelves and then get rid of anything that isn’t adding value to your life. Visibility is key, use clear storage bins for smaller items. 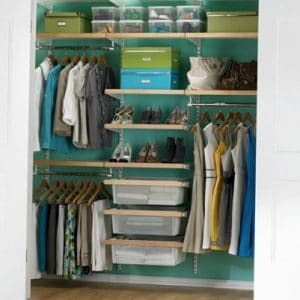 You should be able to see everything in your closet without moving too much. If you are decluttering a closet that you don’t use to store clothing, it can be really tempting to stack, don’t do it! Consider adding more shelving above things that you may keep at the bottom, like a vacuum cleaner or storage bins. You can also add hooks inside the door for brooms, mops and dustpans. It’s a daily journey to keep order in your home by consistently picking things up and putting them away in their place, a habit to instill over time. You should expect regular upkeep, but just be glad that the new system is far more efficient than the old one. The goal is to set up a space that works well for your needs and ultimately makes you calm and happy!